This story seems to have kicked open Pandora’s box, prompting us to provide our readers with additional information that has come to light. For context, I’m updating the existing story, and for those who care, it is advisable to first read the original post below. 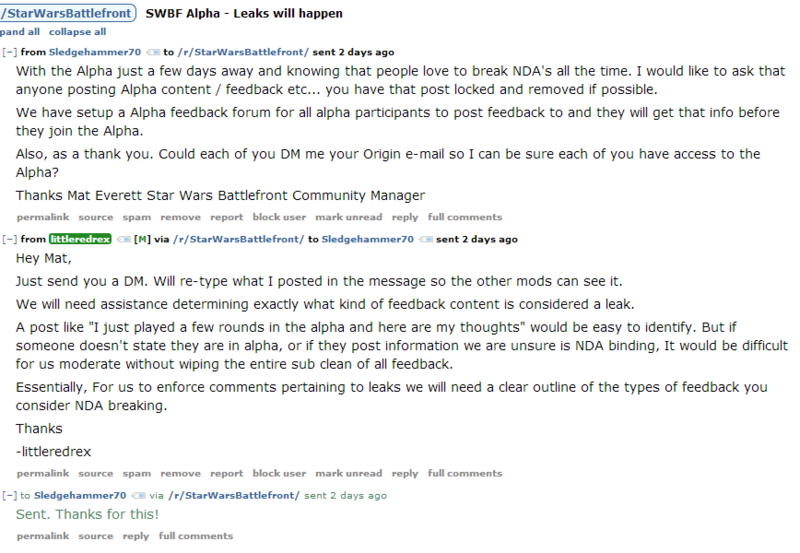 It’s evident that the content which Everett was requesting to remove was not “negative” Star Wars Battlefront posts, but posts that break EA’s NDA for the closed alpha. It’s also clear that requesting the deletion of said content was in violation of Reddit’s policies as outlined by the admin (Sporkicide) responsible for banning Everett as well as the mods involved. Although Everett did take the time to clear up the confusion about “bribes” in this Reddit post, it’s hardly surprising why his initial message seems inappropriate. The issue here isn’t whether the mods accepted the offer or not. The issue here is the placement of the offer, and the fact that a gesture of this sort wouldn’t exactly fly anywhere else. Bribe may be too harsh a word, but even as a “thank you,” it comes across quite inappropriate. As for the other “perks” mentioned, we’re told that those were part of an unrelated exchange. Make of that what you will. This message [posted above] is an indicator of something seriously inappropriate and should have been reported to the admins at the time, but there was also additional evidence of EA contacting moderators (and not just of this subreddit) and asking for specific removals and NDA enforcement. EA has legal options at their disposal to enforce their agreements that do not include violating our user agreement by coercing moderators to do it for them. What I do have evidence of is an EA employee being directly involved in the removal of posts and enforcement of an EA NDA, both of which are some of the few things that mods are expressly not allowed to do, and which is incredibly inappropriate for a company representative on the site to ask for in the first place, hence the consequences. There was no “misinformation” about it, the action was based on evidence and not just the screenshot that has been previously posted. The admins will be communicating with the EA CM. I know it is really cool having those involved with the game here, but everyone has to play by the site rules, regardless of who they work for. It’s worth pointing out that Everett and the mods involved were banned months after these events took place, so we do wonder why this action came so late. But as previously stated, neither of the parties have been able to provide strong evidence to support any of their claims. As far as the ex-mod Unwanted_Commentary is concerned, we’re told that his “demodding” wasn’t solely because of the reasons he stated, but also because of questionable actions including unwarranted collection of IP addresses. We’re not going to get into this debate, however, because that’s not our main issue. It’s the exchange between Everett and Reddit mods that is a real concern and while we can’t judge anyone’s intentions, we sincerely hope lessons have been learned here. Making such an offer in the way it was made would be deemed inappropriate in any field, let alone this one. A pretty damning allegation has been made against an EA representative and some Reddit mods ahead of the highly-anticipated launch of Star Wars Battlefront on November 17. 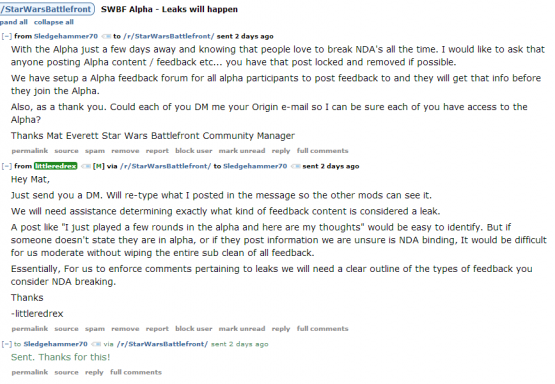 Apparently, moderators of the game’s subreddit were asked by the rep to remove any negative Battlefront posts in exchange for early access to the closed alpha, tickets to the Star Wars festival, and more. There was a representative from EA directing moderators to remove posts and prevent certain links from being posted. In exchange, moderators were given perks including alpha access. This had been going on for a while and is completely unacceptable, whether you were personally the moderator to yank the post or not. It appears to have been clear to all moderators what was being asked and what was being provided in return. They accepted favors in return for moderator actions. They farmed the subreddit nonstop for YouTube revenue by stickying videos made by the moderators and adding referral links in the sidebar. They turned a blind eye to the massive astroturfing operation that is underway in the subreddit. They exposed personal details about users that were confided in private. Unwanted_Commentary later updated the post with screenshots and more info, which you can check out by following the source links below. How EA will respond to this remains to be seen, but what do our readers think the company’s course of action should be?